Souillon is one of the most popular webcomic drawers in France. After attending thre courses in the faculty of visual arts in Paris, he started his training in the multi-media branch in the school Gobelins. 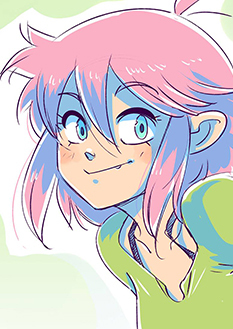 He started to work for a website which was specialised in online videogames called GOA, and at the same time, in 2007, he started to draw and post his successful webcomic Maliki, which he keeps updating frequently with his assistant Becky. Since then, he has published 8 Maliki volumes with Ankama, and also Hello Fucktopia (published in Spain by Fandogamia).